In a career spanning two decades, Bengali filmmaker Rituparno Ghosh directed movies that spoke volumes of his deep understanding of human emotions and relationships. Hailed as one of the most important Indian directors of his time, Ghosh's journey to cinematic greatness was abruptly cut short when he passed away in his sleep early Thursday morning. Raja Sen remembers the late maverick. 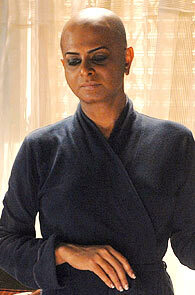 I met Rituparno Ghosh earlier this very month when he invited me on the sets of his new film, Satyanweshi, in Kolkata. Ghosh and I shared some common friends and had tweeted cordially to each other before, but I hadn’t met him till I got onto his set and he -- a be-turbanned sultan comfortably in control of a period drama -- turned to me and smiled. It was a big, genial beam, the kind that instantly draws you in, and I gratefully smiled back. I spent a little time with him over the next couple of days, trying my best not to get in his way, and now all of that -- even the long conversations we had, and our interview about the new film and Bengali literature -- seem horribly fleeting. Over the last 20 years, Ghosh has been an incredibly important Indian filmmaker, a sensitive craftsman who did not allow his perfectionism to stand in the way of his dizzyingly prolific output. There are many films -- and we all have our favourites -- but what characterises Ghosh’s filmography, in my opinion, is a certain tenderness to the whole. It was as if he genuinely loved the characters he peopled his films with, and dealt with them fraternally, maternally, and like close friends. Just because a minor character was a plot contrivance doesn’t mean they could be brushed aside. They mattered to Rituda, and especially in several silent bits of his films, this fondness clearly shows. when not silent, the words crackled. There might have been the occasional false beats in his dramas -- some of which I’ve called overwrought in the past -- but the man was a true master of dialogue. The running gag is that all his characters sound the same and talk the same way -- which is to say, like him -- but Ghosh always made the lines work magically. People spoke and we related to them, even when they spoke languidly and poetically, like we never would, or could. We related because he made us feel their love, their anguish, their melancholy. He was 49, and he had so, so many stories to tell. There were ideas lined up for several films after the new one -- which, by the way, stars Kahaani-director Sujoy Ghosh in the lead -- but alas, we won’t be fortunate enough to see any of them. It’s a devastating bit of news to wake up to, not least because he remained relentless and stood, tall and bold, in a country that looks increasingly shorn of true storytellers. His shadow will linger on -- and dramatically so. Based on my very minimal interactions, Rituda was a warm, sweet person -- even though these aren’t the most visible traits when a man is on the sets scolding his actors because he knows exactly what he wants. He was precise and unyielding, often grumpy in the quest for the right take, and his vision remained undimmed. He was also highly articulate and erudite, to the extent that our impromptu conversations made fascinated actors eavesdrop, just so they could hear him wax eloquent. The passion was tremendous, and striking. I only hope Satyanweshi, which I believe he finished shooting just before his unfortunate passing, sees the light of day as he would have liked it. Given just how specific he was with the instructions on set -- and how in sync his crew was with him -- one hopes the film will emerge exactly according to plan. Just so he can smile at his swansong from above. Like I said, that shadow will linger. Much love, Rituda. May the lighting up there be just the way you like it.